Israel is under attack. The hate that has been carefully instilled in the Arab population, in Jerusalem, Palestinian Authority controlled areas and throughout the State of Israel is bursting at the seams and individual Arabs, mostly young people, are committing attack after attack. You have to be taught to hate and, unfortunately, the Arabs have been teaching their children to hate Jews for years. To become a murderer of Jews, even if it means their own death, is the ultimate aspiration. Those are the people who are honored in their society. Israel is a Jewish State but Arabs live amongst us, everywhere. It is our neighbors, people that work with us, go to the same universities and shop in the same stores that are rising up to kill us. Knife wielding Arab teenagers are stabbing elderly Jews. Others are throwing rocks and Molotov cocktails at Jews driving home with their kids. Arabs are rioting all over the country, attacking police and trying to block main roads, cutting off Jewish freedom of movement. These are not desperate people attacking “oppressors”, they are hopeful people who believe that terrorism will enable them to transform Israel in to Palestine. Not two countries side by side but rather one country instead of the other. The Israeli government and security forces are doing everything they can to protect the people of Israel. The problem is that the threat is from within and thus it is not possible to prevent all attacks. It is easy to stand in front of an approaching army but what do you do when it is the woman walking next to you who suddenly stabs you?! For this reason the Israeli police have asked people licensed to carry guns to carry them – everywhere. It is civilians, just as much as Israeli security forces, who are protecting each other. In one case a man who was stabbed managed to pull out his personal weapon and shoot the terrorist trying to kill him. In other cases, Israelis with (and without) guns have chased down terrorists to stop them from hurting additional people. In Israel guns are for protecting family and fellow countrymen. The prevailing attitude is that “I am my brother’s keeper.” Israelis don’t wait for the government or the “authorities” to save them. We save each other. Israelis take guns very seriously. They are not toys. Shooting isn’t fun. Even hunting is frowned on by most people. Guns are for protecting lives – not attacking your enemy, they are for protecting your family, friends and neighbors. The guns in the streets of Israel are what protect me, my family, friends and fellow countrymen from people who are trying to kill us. People who sometimes succeed. I was born in Detroit and have seen people there with guns in the street. The difference is in the people holding the guns and their motivation for having them. That makes all the difference in the world. 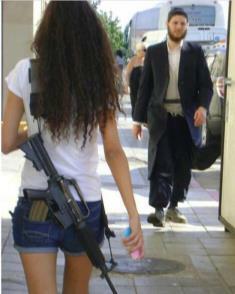 I am glad that there are guns in the street in Israel. I wish we didn’t need them but since we do, I am glad they are there. To be more accurate, I am grateful for the people who can and will use them when they are needed.